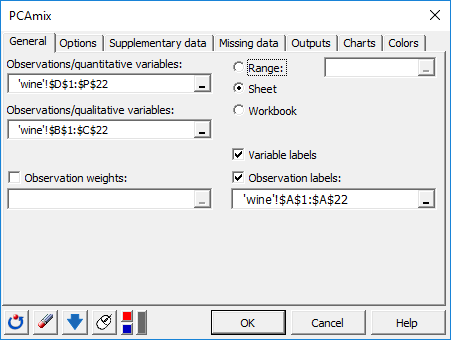 Use PCAmix method to analyze a data table where observations are described by quantitative variables and qualitative variables. Available in Excel with XLSTAT. What is Factorial analysis of mixed data? Factorial analysis of mixed data is a method initially developed by Hill and Smith (1972). A few variants of this method have been developed since then (Escofier 1979, Pagès 2004). The method used in Xlstat is called PCAmix and was developed by Chavent et al (2014). 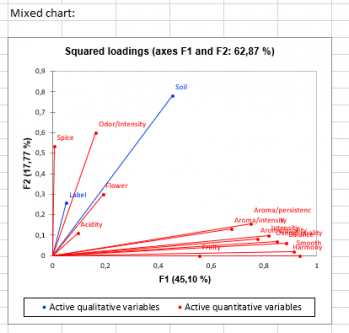 This method can be seen as a mixture of two popular methods of factorial analysis: Principal Component Analysis (PCA) which allows to study an observations/quantitative variables table and Multiple Correspondence Analysis (MCA) which allows to study an observations/qualitative variables table. Similarly to other factorial analysis methods, PCAmix aims to reduce data dimensionality as well as to identify nearness between variables but also proximity between the observations. Several options ranging from the selection of data to the display of results are available such as introducing observation weights, filtering factors based on inertia, adding supplementary observations/variables and customizing charts. The PCAmix method supplies the same classic results as other factorial analysis methods: factorial coordinates, contributions and squared cosines. These results are interpreted in the same way as in PCA or MCA. A specific output of PCAmix is called squared loadings of variables. The squared loading between a quantitative variable and a factorial axis is equal to the squared correlation between the variable and the axis. The squared loading between a qualitative variable and a factorial axis is equal to the correlation ratio between the variable and the axis. 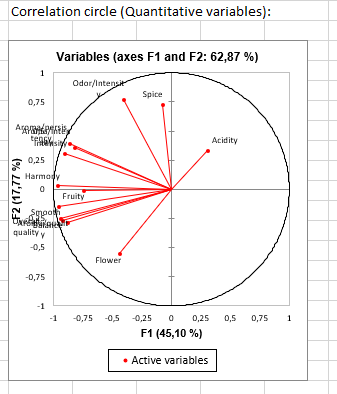 Correlation chart: shows the correlations between the components and the quantitative variables. 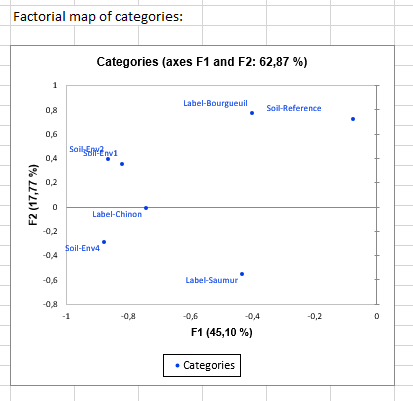 Factorial map of categories: shows the principal coordinates of categories of active and supplementary qualitative variables. 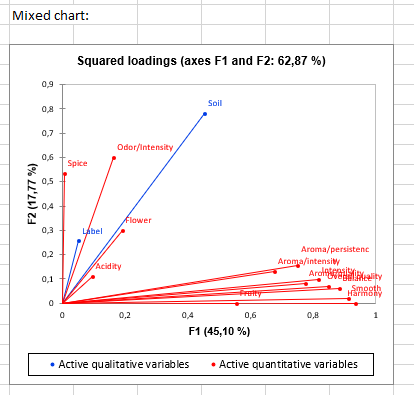 Mixed chart: mixed chart of squared loadings for quantitative and qualitative variables. Factorial map of observations: chart representing the principal coordinates of observations.